Shares of Momo (NASDAQ: MOMO) gained 28.1% in January, according to data from S&P Global Market Intelligence. After ending 2018 with three months of big selloffs, Chinese tech stocks have bounced back early in 2019, and Momo has benefited from the market momentum. 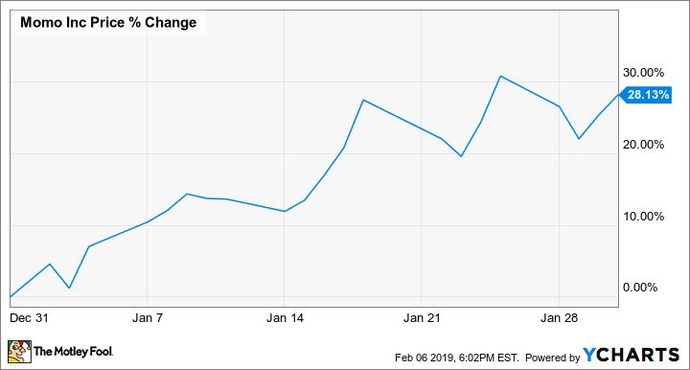 Momo stock lost roughly 46% of its value from October through December, and the stock posted big gains in January as the market regained some ground. There doesn't appear to have been any company-specific news behind the company's stock gains last month, but Momo trades at low multiples compared to its earnings trajectory, and investors piled back into the stock as skittishness in the broader market abated. With the company's core app still posting solid growth and the acquisition of Tantan making it a clear leader in China's online dating and social media markets, Momo is a stock that could see more big gains if the country's tech sector continues to recover. The company's monthly active user base continues to climb (up 17% year over year last quarter), and while growth is decelerating, there's a case to be made that the company's nonprohibitive valuation and strong position in what looks to be a growth industry could make the stock a worthwhile portfolio addition. Shares trade at roughly 10.5 times this year's expected earnings, and the company has a forward price-to-earnings growth ratio of roughly 0.15 -- metrics that suggest the stock is cheap at current prices. Dating-based social media sites have historically been prone to disruption, with large segments of users migrating when popular new services arise, but Momo should be on the radar of growth-focused investors seeking exposure to China's consumer tech sector. Keith Noonan has no position in any of the stocks mentioned. The Motley Fool recommends Momo. The Motley Fool has a disclosure policy.